Ideal for use in cable chains as well as for free movement that will provide a long-term solution to many regular flexing applications. This is due to the use of fleece tapes screen and talcum to enable the core bundle and the screening braid to move easily as the cable flexes without any damage causes. 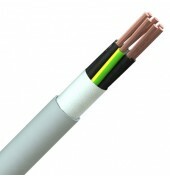 Very fine copper wire strands to BS6360/IEC 60228 Class 6. Black polyolefin insulation with white numbers. A green/yellow earth core is included in cables with more than 2 cores. Cores twisted in layers & fleece taped. Textured grey polyurethane outer sheath to RAL 7001.